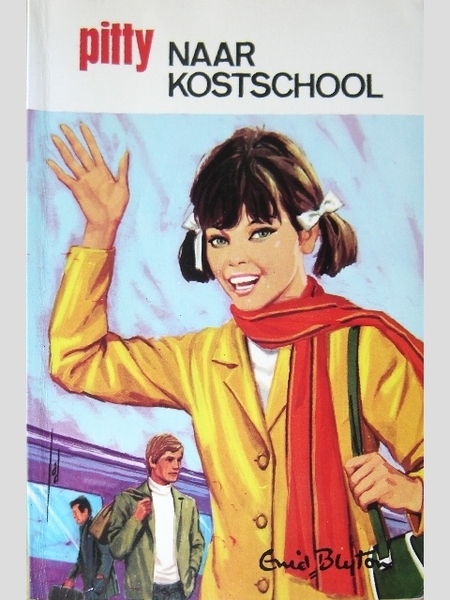 I found the cover to this (presumably) Dutch edition on LibraryThing, and am utterly charmed by its inappropriateness. ‘Can we see Malory Towers from here?’ asked Darrell, looking all round. ‘No. I’ll tell you when we can. There’s a corner where we suddenly get a glimpse of it,’ said Alicia. Darrell could feel the warmth in Pamela’s voice as she spoke of the school she loved. She looked at her and liked her. Darrell looked. She saw a big, square-looking building of soft grey stone standing high up on a hill. The hill was really a cliff, that fell steeply down to the sea. At each end of the gracious building stood rounded towers. Darrell could glimpse two other towers behind as well, making four in all. North Tower, South, East and West. The windows shone. The green creeper that covered parts of the wall climbed almost to the roof in places. It looked like an old-time castle. No one would ever mistake Blyton for a great stylist, but I do love her description of the school. I don’t think St Clare’s is such a vivid physical presence in the series. ‘It’s just like a castle entrance!’ said Darrell. ‘Yes,’ said Gwendoline, unexpectedly, from behind them. ‘I shall feel like a fairy princess, going up those steps!’ She tossed her loose golden hair back over her shoulders. Alicia’s typically scornful, and promises that Miss Potts will knock such fancies out of Gwen. Which makes me feel rather bad for her, because at twelve I still nursed secret princess fantasies, and frankly don’t think they ever hurt anyone. On the other hand, Blyton doesn’t seem to regard this as an expression of imagination from Gwen, more like vanity and self-indulgence. But it’s not as if Alicia’s attitude is going to help Gwen develop as a person. …also, I suppose, by the time I was twelve, they were secret princess fantasies (and secret starship captain fantasies, and secret superheroine fantasies) for a reason. Each of the Tower houses had its own matron, responsible for the girls’ health and well-being. The matron of North Tower was a plump, bustling woman, dressed in starched apron and print frock, very neat and spotless. Alicia took the new girls to her. ‘Three more for you to dose and scold and ran after!” said Alicia, with a grin. Darrell looked at Matron, frowning over the long lists in her hand. Her hair was neatly tucked under a pretty cap, tied in a bow under her chin. She looked so spotless that Darrell began to feel very dirty and untidy. She felt a little scared of Matron, and hoped she wouldn’t make her take nasty medicine too often. Then Matron looked up and smiled, and at once Darrell’s fears fell away. She couldn’t be afraid of a person who smiled like that, with her eyes and her mouth and even her nose too! ‘I’m Gwendoline Mary Lacey,’ said Gwendoline. Legacy student privilege. The old (brown and orange) school tie. I liked Alicia a lot as a kid, but these days I think Gwen isn’t the only one who needs a few lessons in social graces. Darrell looked round at the tables. She was sure she would never know all the girls in her house! And she was sure she would never dare to join in their laugh and chatter either. But she would, of course—and very soon too! And if you’re thinking this seemed like a very short chapter, you’d be right — I estimate chapter 1 clocked in at about 2200 words; chapter 2 looks like it’s 1800-1900, roughly. Now, I’m off to rearrange my room and hopefully create a more congenial space for writing. Provided that I can find my tape measure. The cover of the 1988 edition – the one I owned! Begin at the beginning, right? 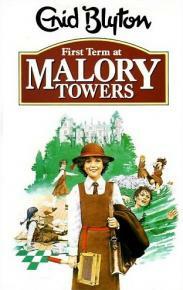 Although I must confess that the first Malory Towers book I read was Upper Fourth, sitting in the bedroom of my friends down the road. I was nine, and my parents, who were trying to wean me off Enid Blyton, were not too pleased when I came home with a whole new obsession. Darrell Rivers looked at herself in the glass. It was almost time to start for the train, but there was just a minute to see how she looked in her new school uniform. Normally this would be a handy chance for the author to slip in a description of her main character, but instead we only know what Darrell is wearing. The school is as much a character as any of the girls, and this is essentially what all the characters will be wearing most of the time. Blyton, in general, doesn’t describe the physical appearances of her main characters — I think we do eventually learn that Darrell is tanned, with short dark hair and bright eyes, and in the Famous Five series we know that George is … also tanned, with short dark hair and bright eyes, and looks like a boy. But other aspects of her main characters’ appearances are often conveyed only through the illustrations — Anne’s perennial golden bob and headband, for example. My inner Nancy Mitford compels me to point out that Blyton uses the upper middle-class “glass” instead of the decidedly non-U “mirror”. Darrell felt excited. She was going to boarding school for the first time. Malory Towers did not take children younger than twelve, so Darrell would be one of the youngest there. She looked forward to many terms of fun and friendship, work and play. HINT: Darrell’s quest for a friend is the main emotional theme of this novel! TRY TO KEEP UP. Darrell’s father, like Blyton’s second husband (for whom Darrell herself was named), is a surgeon. Blyton’s father characters are generally cranky types who occasionally appear from out behind a newspaper to lay down the law, but Mr Rivers is unexpectedly vivid. And whatever you think of the psychology of portraying your new husband as your self-insert’s father, Blyton’s affection and admiration for the man is obvious. We’re off to London to catch the school train. It’s a scene that will be familiar to anyone who’s read Harry Potter (so, everyone): a dedicated train, a platform crowded with students who all seem to know each other, and one rather lost newbie. The Malory Towers train, though, is divided into four carriages, one for each house. Sadly, students aren’t assigned to their houses by singing haberdashery, but stay tuned for a few chapters and I’ll get around to talking about how Blyton is Team Hufflepuff all the way. Darrell looked for her mother. Ah, there she was, talking to a keen-faced mistress. That must be Miss Potts. Darrell stared at her. Yes, she liked her—she liked the way her eyes twinkled—but there was something very determined about her mouth. It wouldn’t do to get into her bad books. Re-reading a few months ago, I was struck by just how likable a character Miss Potts, Darrell’s house-mistress, is, and also how much she’s basically Minerva McGonagall. JK Rowling owes such a debt to these books — and I mean that in the best possible way — that I’m really surprised no canny US publisher has bothered to release them over there. Darrell looked to where Alicia nodded. She saw a girl about her own age, dressed in the same school uniform, but with her hair long and loose down her back. She was clinging to her mother and wailing. The mother was almost as bad as the girl! Tears were running down her face too. Our adolescent drama queen is Gwendoline Mary Lacey (or, in some books, Lacy). She’s a spoilt, selfish only child who has been sent to boarding school to get some common sense bullied into her. She’s a fairly horrible person, but as a child, the very first fan fiction I ever wrote was redemption fic. Another girl came up to the carriage, a small, sturdy girl, with a plain face and hair tightly plaited back. ‘Is this Miss Pott’s carriage?’ she asked. ‘Yes. I’m Sally Hope,’ said the girl. I’m not going to start taking a shot every time someone says “Gracious!” I promise. Sally is one of the most interesting characters of the book — though not necessarily the series — but to say more at this point would involve spoilers. AND YES, I’M WORRYING ABOUT SPOILERS FOR A BOOK PUBLISHED IN 1946. Here’s a nice early glimpse at Alicia’s less charming qualities. In Harry Potter and the Philosopher’s Stone, we know that Draco is a nasty little boy because his second attempt at befriending Harry involves insulting Ron’s family. Here, Alicia does the same and it’s presented as amusing, although also quashed flat by Miss Potts. BECAUSE MISS POTTS IS ACTUALLY THE BEST. Miss Potts looked at Gwendoline. She had already sized her up and knew her to be a spoilt, only child, selfish, and difficult to handle at first. She looked at quiet little Sally Hope. Funny little girl, with her tight plaits and prim, closed-up face. No mother had come to see her off. Did Sally care? Miss Potts couldn’t tell. Then she looked at Darrell. It was quite easy to read Darrell. She never hid anything, and she said what she thought, though not so bluntly as Alicia did. In conclusion, POTTS. I bet she’s the maiden great aunt of Pepper Potts, and taught her everything about being super-fabulous, organised, smart and BETTER THAN EVERYONE ELSE IN THE WORLD. ‘I feel sick,’ announced Gwendoline at last, quite determined to be in the limelight and get sympathy somehow. But Darrell looked at Alicia with amusement and liking. How she would like her for a friend! What fun they could have together! An adult man reads a Malory Towers book for the very first time. Starting with the final one, no less! I like his verdict — after commenting on the, uh, questionable treatment of Mamzelle Dupont and the sad lack of Darrell’s notorious temper in this book, he concludes: I think it does no harm to sample a setting where there are a variety of female role models to choose from. That made me think of an earlier idea of mine, to do a chapter-by-chapter reading of the Malory Towers and St Clare books, and possibly also the Naughtiest Girls. I read the first two series just a few months ago, and had a lot of thoughts about the treatment of class (obvious) and fatness (less so), and also the characters in general. Maaaaaaaaaybe as a once-a-week thing? Or, possibly, twice a week, given that I have Wednesdays off. I’ll give it some thought while I do my groceries, and may start later this afternoon.